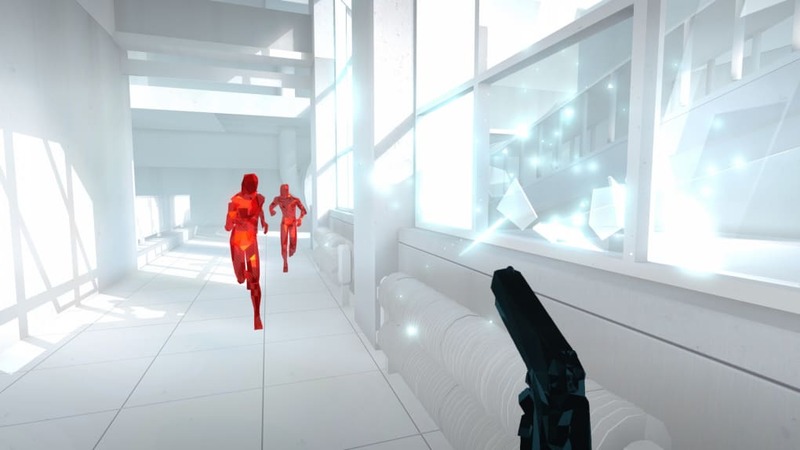 SUPERHOT is the most innovative shooter I’ve played in years. 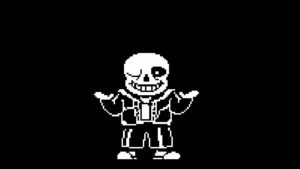 Sorry, I don’t know what came over me there. 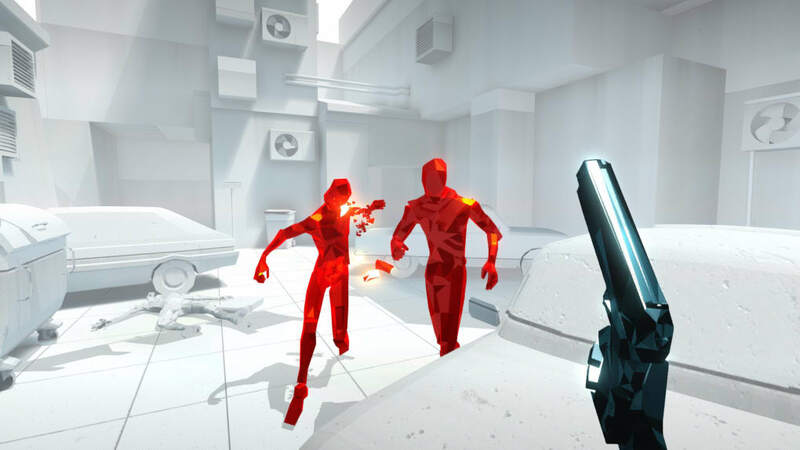 What I meant to say was that SUPERHOT is a fantastic game that combines first-person gameplay with (almost) turn-based puzzling elements to create something totally consuming for its two hour campaign. 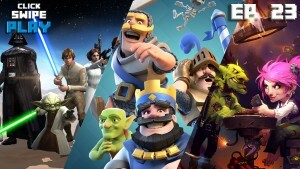 After that, your continued obsession will depend on how absorbing you find its endless and challenge modes. 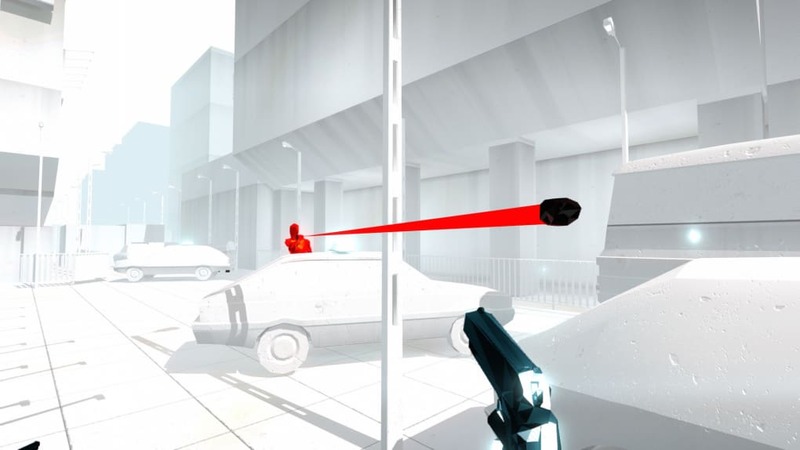 With a blend of retro-styled DOS command menus, and a VR style that looks to have been inspired by a fusion of The Lawnmower Man's lowpoly count and Mirror’s Edge's red and and white color palate - SUPERHOT oozes style from the start. In an understated opening, you begin by messaging a friend in a chatroom. All they can talk about is an amazing game that has been discovered on a company’s internal servers and cracked for a community of hackers to enjoy. They send you the file and, after loading its EXE, you are playing SUPERHOT. Its premise is perfect. You control the action like a first-person shooter but the world pauses – or at least slows to a complete crawl – whenever you are stationary. 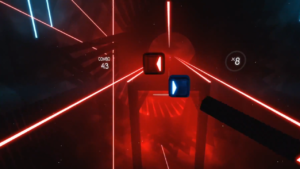 This means you can look around, aim, and plan your moves before executing them. 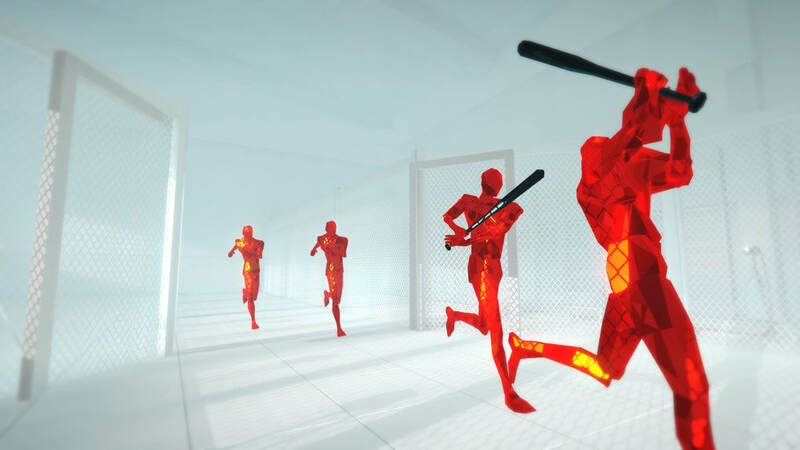 And execute is the word, because SUPERHOT has you shattering every red enemy like glass to progress. While this starts with you just running and shooting, pretty soon you find yourself punching foes, dodging bullets, jumping cars, and hurling your gun at enemies. This last maneuver is particularly entertaining. Once you exhaust your weapon's limited magazine, you can throw it at an enemy to cause them to catapult their gun into the air - allowing you to grab it and keep firing. But, for all of its tense gunplay, each level of SUPERHOT is really just one big puzzle that you must find the solution to. You have to manage a balance of strategy, precision, position, and action: decide who to take out, know when to toss your weapon and grab a new one, and be aware of all the dangers around you. The tension is heart pounding - even in slow-motion. 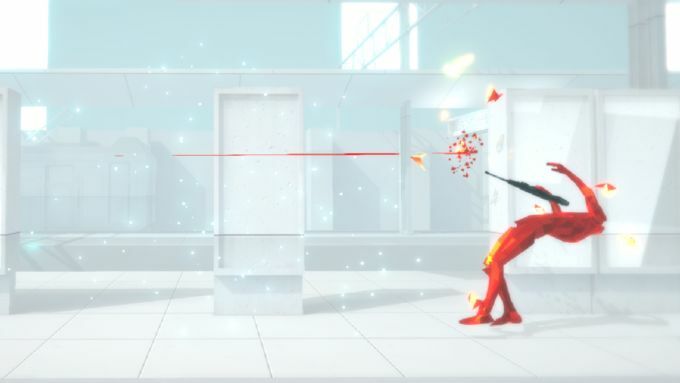 Reloads feel like they take forever while you try to outmaneuver the streaking red bullets that fill the air of SUPERHOT's sterile white world. It is a blend of mechanics that has you constantly begging for one more go, while its almost hypnotic style keeps you transfixed. 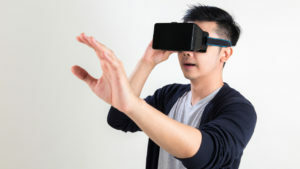 All so you can complete the stage and hear a computerized voice declare that you are SUPER... HOT... and watch the level replay at full speed. The problem is that it ends too quickly. If you are lucky, the 32 mission story could last you three hours – or, like me, you could be done in two. True, the Challenge and Endless modes fill it out, but I am still left wanting more. 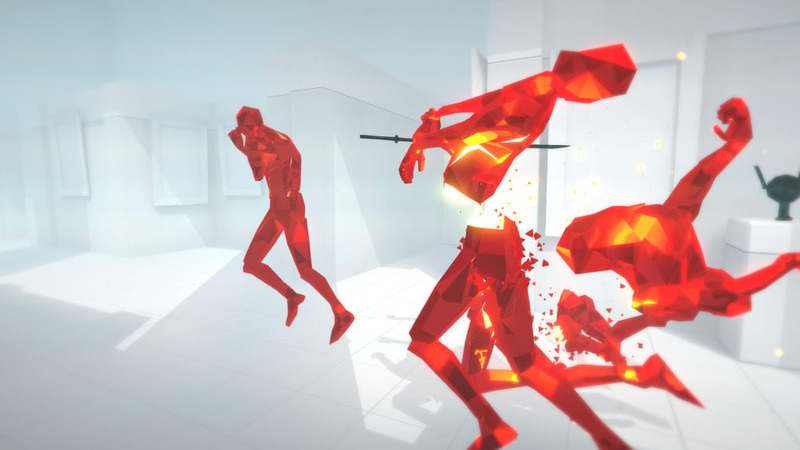 SUPERHOT’s blend of mechanics and style is amazing. 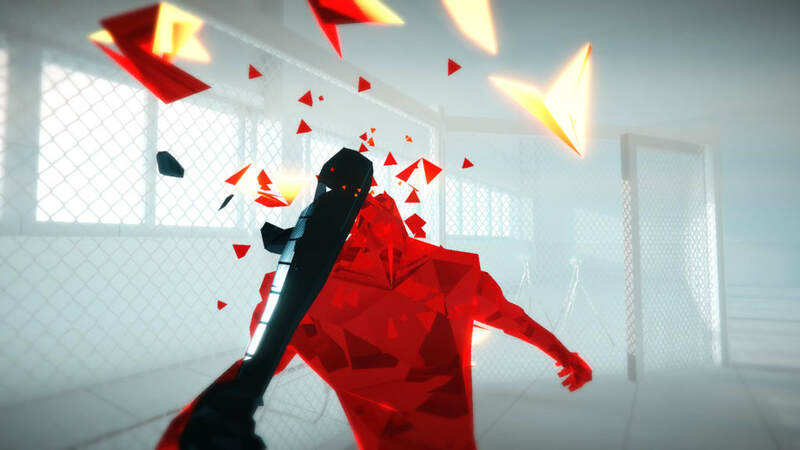 While it is like no other game, it manages to do what Hotline Miami did before it: taking action based gameplay and adding puzzle elements that energizes genre fans while opening it up to a new audience. Plus it adds lashing of style. Just be prepared for disappointment when its ends too soon. 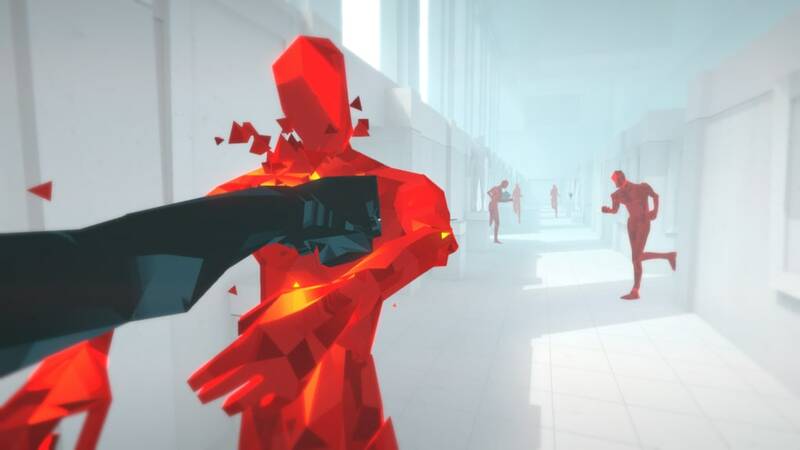 What do you think about SUPERHOT? Do you recommend it? Why?